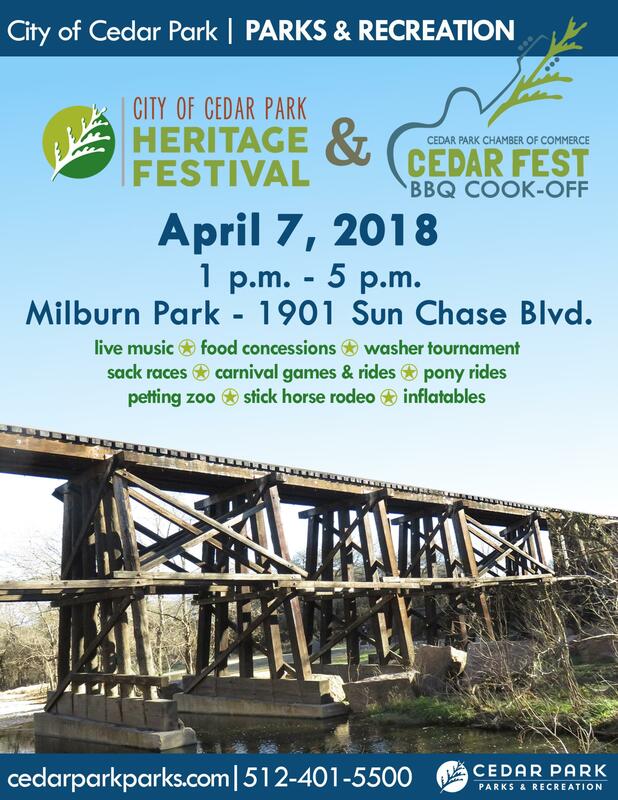 This year's Heritage Festival will be held in conjunction with the Cedar Park Chamber of Commerce Cedar Fest BBQ Cook-off. For more information regarding the BBQ Cook-off, please call (512) 260-7800. You are welcome to bring your own ice chest, no glass containers please. Dance to live music, free inflatables, train rides, pony rides, and petting zoo. Fees apply for face painting, carnival games, rock wall, super slide, quad jump, spinner ride, hamster balls, and mechanical bull. Enjoy historical displays, washer tournament, food concessions, free photos with a longhorn (bring your own camera), sack races, stick horse rodeo for ages 3 - 8, demonstrations, and a corn on the cob eating contest.